Our student has designed an affordable and eco-friendly electric car that runs at just 20 paise a kilometre. A programme for pre-counselling for CET , COMED-K, Career Guidance & awareness about autonomous Colleges was held at the Placement Cell Auditorium on 23rd May 2015 at 3:00pm. 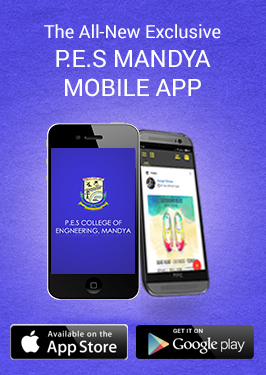 Team PESCE successfully completed campaigning at Vidya vardhaka,NIE & vidya vikas engineering colleges. Flash mob was an effective promotion and crowd responded heartily. What a way to start the publicity, kudos to all students and organizers. IEEE-PESCE's annual technical magazine AURIFERA - Volume 5 Issue 1 was released. It's result of hard work of entire AURIFERA team. Shubham, Pratyush, Subhodip, Vidyashree, Kalyani, Geetika, Raju, Sharath, Manjunath, Karthik & Chiranjeevi . ‬Plastic bags are non-biodegradable. Plastics kills at least 2 million birds, whales, dolphins, seals, seal lions and turtles every year. It's time to switch to reusable ‪#‎PAPER_BAGS‬. ‪#‎IEEE‬: Advancing technology for humanity. Lets use reusable paper bags and make our world a better place to live!! 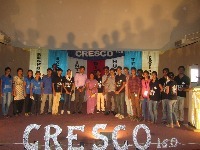 CRESCO is a two day event organized by IEEE students at PESCE. It was held on 10th & 11th of April at our very own campus, where a range of activities like national level paper presentation, C coding competition, cultural night and much more took place. PES Mandya emerged winners at VTU Inter Collegiate Mysuru Zone Volley ball tournament for men for the year 2015-2016. Over 60+ hostelites of PESCE Mandya celebrated Women's day by cutting a cake with Dr M.C Padma. It was later followed by a small speech by Dr M.C Padma and a game of Antakshari. 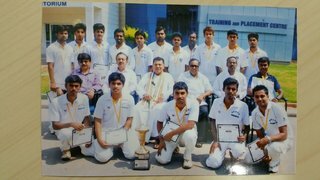 The VTU conducted a Cricket Tournament between 22/2/2014 & 24/02/2014 at PESCE, Mandya campus in which PES Mandya emerged winners!!! VTU organized a Football Tournament at PESCE, Mandya between 11/3/2014 and 12/2/2014 in which PESCE, Mandya emerged winners!!! 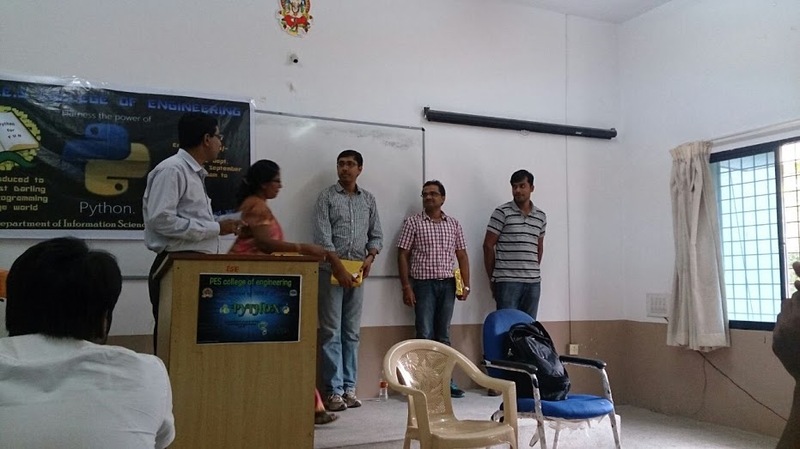 Department of information science and engineering has conducted one day workshop on Python programming on 13/09/2014 . This was a hugely successful event with participation of 50+ students with great enthusiasm. Students found this to be a very good platform to get introduced to a new programming language. The workshop was very well organized with professional speakers from reputed companies like INTEL and McAfee. NEN AKSHAYA E-CELL of P.E.S.C.E Mandya got the HONOUR ROLE AWARD for 2013-2014 under the leadership of Nishit Ranjan(SPOC),mentored by Dr.L Prasanna Kumar and guided by Zonal Head Chaithali Sen Gupta.This is the National Award given by the NEN by considering some of the criteria such as the activities carried throughout the year,involvement of each and every member in the chapter,Entrepreneurial activities or programs conducted by the student chapters and also considering the local body involvement.The award ceremony was held at Srikrishna College of Engineering Coimbatore during the month of March 2014. 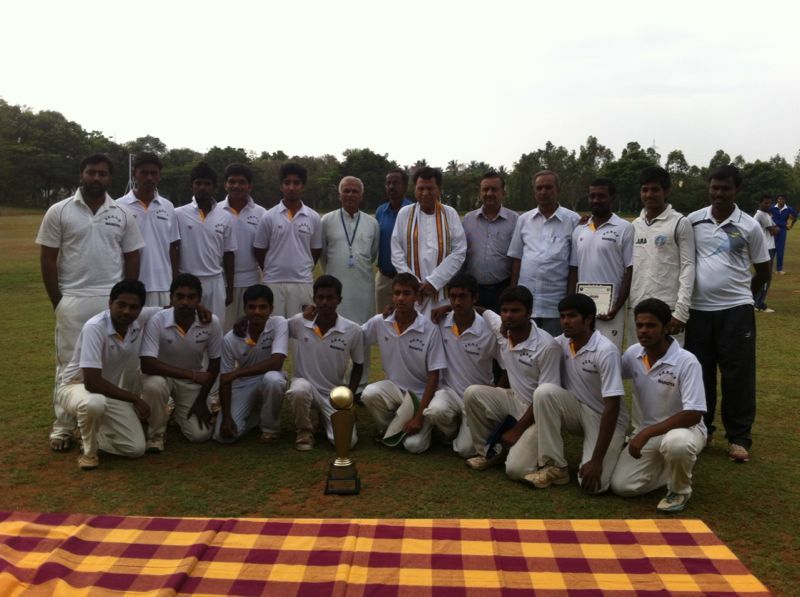 Students of PESCE Mandya has participated in the inter zone cricket tournament held in Shimoga from 24-03-2014 to 29-03-2014 and have won the Championship in the VTU level by defeating GOGTE Institute of technology Belgaum for the acedamic year 2013-2014.This is the first time in 11 years that VTU Chanpionship have come to Mysore zone colleges.